Learn more about the Lorex - 8-Channel 8-Camera Indoor/Outdoor Wired 4K 2TB DVR Surveillance System with pricing, features, and FAQs. The Lorex 8-Channel 8-Camera Indoor/Outdoor Wired 4K 2TB DVR Surveillance System allows you to monitor the interior or exterior of your home or office. 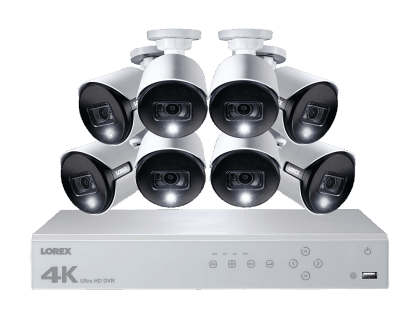 The Lorex security camera system features an active deterrence DVR security system, 8-channels, 4K ultra HD video, LED light, and color night vision. Pros: Excellent video quality and night vision, good storage capacity. Bottomline: Easy to set-up, great 4K video quality, good surveillance system for home/office use. What is the price range of the Lorex 8-Channel 8-Camera Indoor/Outdoor Wired 4K 2TB DVR Surveillance System? The Lorex 8-Channel 8-Camera Indoor/Outdoor Wired 4K 2TB DVR Surveillance System ranges between $599.99 and $899.99, depending on how many cameras you need. Where can I buy the Lorex 8 Channel 4K Surveillance System? You can buy the Lorex 8 Channel 4K Surveillance System online from sites like Bestbuy, Amazon, and Costco. Does the Lorex 8 Channel 4K Surveillance System have a LED light? Yes, the Lorex 8 Channel 4K Surveillance System has a bright customizable LED light to ward off intruders. How will the Lorex 8-Channel 8-Camera Indoor/Outdoor Wired 4K 2TB DVR Surveillance System alert me if there are intruders? The Lorex 8 Channel 4K Surveillance System sends mobile notifications and has a remote-triggered siren, which sets off a loud siren to deter criminals. What are some Lorex 8-Channel Wired 4K 2TB DVR Surveillance System alternatives? Zmodo Smart Wireless Security Camera. Swann 8 Security Camera System. D-Link Full HD WiFi Camera DCS-8300LH. Microseven 1080P HD 20X Security Camera.